In the Autumn of 2017, a certain indie game became something of a phenomenon. Getting Over It with Bennett Foddy became a masochistic smash hit, as more than 2.5 million people tried to drag their cauldron-bodied avatars up a mountain using nothing but a sledgehammer. Now, thanks to the release of Just Cause 4, Getting Over It has been granted a second lease of life. The Just Cause games have long embraced easter egg culture – my personal favourite is the adorable robot shark from Just Cause 2 – and Rico’s latest outing is no exception. On a rocky outcrop in a remote mountainous corner of Solis, the world’s most pyromaniacal mercenary can stumble across a cauldron and pickaxe. Interacting with those transforms Avalanche’s open world into a 2D side-scrolling experience, in which Rico’s lower half is trapped in a cauldron. In his hands is a pickaxe, which he can use to drag and propel himself across the scaled-down landscape, thanks to a physics engine clearly borrowed from Bennett Foddy’s original game. Thankfully, this version of the game (which you can watch above, via Kotaku) isn’t as long as the original. It only takes Rico a few minutes to get from one end of the gauntlet to the other, drastically less than it took many of Getting Over It’s original players. 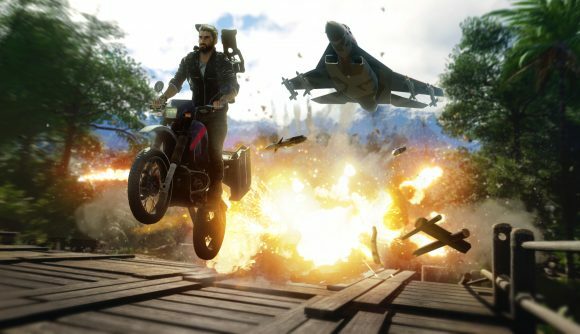 Just Cause 4 launches today, meaning that Rico is already winging his way to South America. You can check out our Just Cause 4 review if you’ve yet to make your mind up on the game – if you’re already a fan of the series, it seems like the explosive chaos you know and love is back and bigger than ever.